Stock markets worldwide are plunging just by the virtue of the Greeks’ unwillingness to bite the austerity bullet once more as imposed upon them by the Troika Vulture Funds. Born and raised in animal farms, fed with artificial food, kept barely alive by toxic antibiotics, herded like cattle from feeding grounds to places of tillage, harvesting the fruits of our own labor, we are all being cooked and fried literally with the same oil that comes from own body. Imagine how the global markets, that they control, would react if all people around the globe just declare themselves debt-free as a matter of right against all illusory and odious schemes. Imagine if we seize this opportunity to unite ourselves and just act right now in the spirit of our global desire to be free. Imagine the look in their faces as the peasants raise their fists in collective anger and rise in condemnation of the lies and deceptions inflicted upon them for generations. Picture the people in jubilation having conquered themselves and all their fears that the matrix of power have created and induced. This is the day the rulers of the world hoped may never come. Share prices began to plummet across Asia on Monday as hopes dwindled for a resolution to the Greek debt crisis. Japan’s Nikkei stock average briefly fell by more than 500 points in early trading, while the euro dropped more than 3% to 133.80 yen, its lowest level for five weeks. The common currency fell as much as 1.9% to $1.0955, its lowest level in almost a month. The Nikkei fell 2.1%, while MSCI’s broader index of Asia-Pacific shares outside Japan dropped 0.8%. US stock futures dived 1.8%, hitting a three-month low, while US Treasuries futures price gained almost two points. 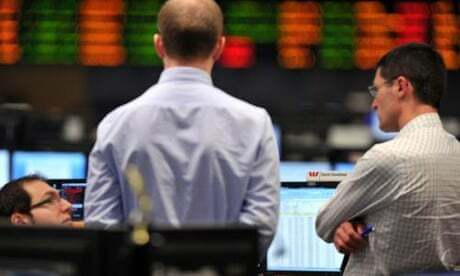 More than $35bn was wiped off the Australian stock market in the first hour of trading on Monday as investors brace for an increasingly likely Greek exit from the eurozone. Turmoil in Asia had been widely expected after the failure of 11th-hour talks in Europe over the weekend raised the possibility of a Greek exit from the eurozone. The embattled country looks set to default on its debt repayment this week, forcing Athens to impose capital controls to halt bank runs. On Monday morning Greeks will find their savings blocked and their banks closed for a week following a weekend that has shaken Europe’s single currency. The Athens Stock Exchange will not open on Monday either. Despite the Chinese central bank’s monetary easing on Saturday, investors were seen flocking to safer assets on the spectre of an unprecedented debt default. In Tokyo, manufacturers that rely on European sales were among the hardest-hit by early losses, along with banks and insurance companies. The broader Topix index of all First Section issues on the Tokyo Stock Exchange was down 37.67 points, or 2.26%, to 1,629.36. The US Treasury secretary, Jack Lew, stressed the need for Greece “to take necessary steps to maintain financial stability” ahead of the referendum. He told the Greek prime minister, Alexis Tsipras, on Sunday that Athens and its creditors needed to continue working toward a resolution ahead of a Greek referendum on 5 July on the creditors’ demands for austerity. A cash-strapped Greece looks certain to miss its debt repayment on Tuesday as Greece’s European partners shut the door on extending a credit lifeline after Greece’s surprise move to hold a referendum on bailout terms. Fear of an imminent default by Greece hit Greek banks, a major buyer of Greek government bills, triggering bank runs at weekend and forcing Tsipras to announce a bank holiday on Monday and capital controls. In a brief televised address to the nation, Tsipras threw the blame onto the leaders of the eurozone. But he did not say how long the banks would remain shut, nor did he give details of how much individuals and companies would be allowed to withdraw once they reopened. 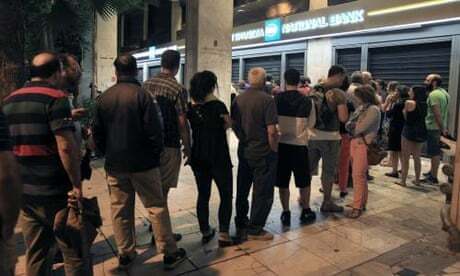 All over Athens people queued at cash machines, particularly outside National Bank branches because the National Bank supplies the banknotes, and lots of other Greek banks, by midnight on Sunday, had no more of those. Alexis Tsipras addresses the nation. Other European banks have limited exposure to Greece. Any speculative selling in debts of such countries as Italy, Spain and Portugal, will likely be countered by the European Central Bank, which started buying eurozone sovereign debts from markets in March to shore up the economy. Yet the perception could change if investors grow more worried about the future of the currency union. Debt crisis: Will Greece exit euro? Greece and its lenders have been gridlocked in talks over its €240-billion debt for about six months. Fears of Greece defaulting are causing a run on the banks, with people withdrawing record amounts of deposits. RT will report on the latest developments. The Macedonian Central Bank has ordered all Macedonian banks to withdraw all deposits and loans from banks located in Greece, as well as from the branches of Greek banks located around the world. The Greek Financial Stability Council has recommended a daily cash withdrawal limit of €60 from Tuesday, while ATMs will be closed on Monday, Reuters reports. Foreign bank card holders will be allowed to withdraw money in accordance with the limit set by their banks. Antonis Samaras, the leader of Greece’s largest opposition party, urged Prime Minister Alexis Tsipras to revoke the referendum and call for a national unity government instead. “Mr. Tsipras must continue the negotiations” and if he cannot he “should attempt a big national consensus,” Samaras said, meaning a unity government, as reported by Reuters. The Greek financial stability council has recommended keeping the country’s banks closed for the next 6 working days, Reuters has reported. Up to 300 protesters from left-wing parties and unions have gathered in Paris to show their solidarity with Greece. Hellenic Petroleum, Greece’s biggest oil refiner, issued a statement on Sunday amidst growing fears of fuel disruptions and chaos in Greece, as reported by Reuters. The company said it had enough reserves to meet market demand for many months and that its refineries were operating normally. In a TV address to the nation on Sunday, Greek Prime Minister Alexis Tsipras announced a bank holiday and capital controls in Greece, blaming other EU countries and ECB for “forcing Greece’s hand.” He went on to call the decision to reject Athens’ request for a short-term bailout extension “an unprecedented act by European standards” that “questions the right of a sovereign people to decide.” He gave no details on how long the measures would remain in force. One of the significant sources of funds for the fascist Nazionist Jesuit Khazarian Mafia is the healthcare industry which registered a whopping $3.09 trillion in 2014, and is projected to soar to $3.57 trillion in 2017, in the US alone. We can help take down the Dark Cabal by avoiding drugs, defeat any viral attack and scaremongering easily by knowing how to build our own comprehensive antiviral system. Find more about it here.